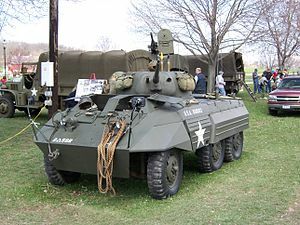 Used by the American Army, it was developed during the Second World War. It had a crew of four, had a top speed of 89 kilometres an hour on road, it weighed about eight tons. The main armament was a 37 millimetre gun and it also had two machine guns. It was used in a reconnaissance role. The main problem was that the armour was thin and could only stop small arms fire. It was used in the Korean War but phased out of service shortly afterwards.